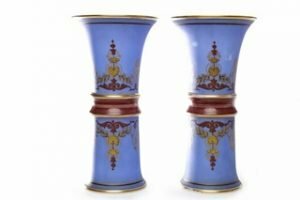 A pair of Victorian glass trumped shaped vases. The exterior is painted with gilt and burnt orange coloured scrolling foliage, all on a mottle blue ground. Approximately 30cm. 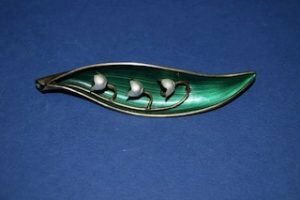 A Norwegian silver gilt and enamel brooch by Arne Nordlie. 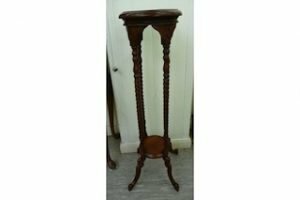 A mahogany finished plant stand. The circular top raised on barley twist supports. Approximately 50cm. 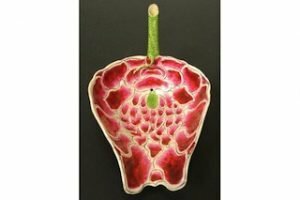 A late 19th century lotus flower nose drinking cup, the green stem forming a tube into the centre of the pink petals of the cup. 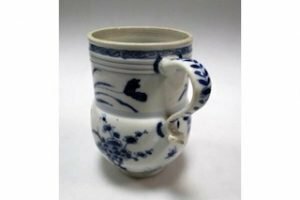 An 18th century underglaze blue and white mug, a blue scroll band painted on the rim above three reeded mouldings at the top of a cylindrical neck painted with flowering plants, the bulbous body below with pink cherry blossom amongst blue foliage to one side. 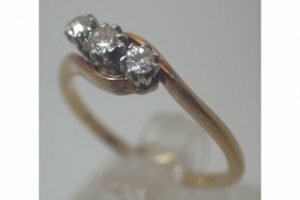 An 18 carat yellow gold three diamond ring, 2.2g. 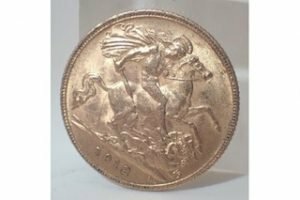 A King George V 1912 half sovereign. 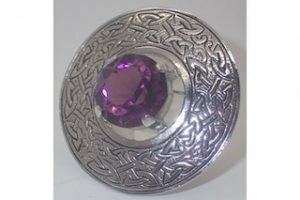 A large Scottish sterling brooch with an amethyst stone to the centre. 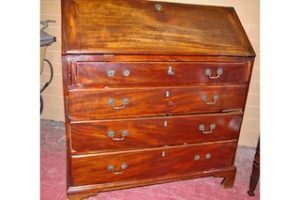 A Georgian mahogany fall front bureau. Having four long lower drawers on corner bracket feet, the fall interior with an arrangement of drawers and pigeonholes, central cupboard door and flanking secret pillar drawers. 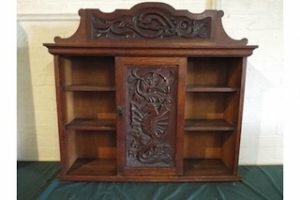 A carved oak wall hanging shelving cabinet with a centre cupboard and raised gallery. 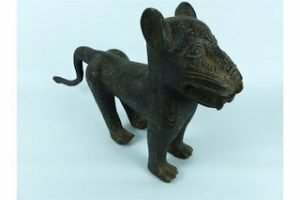 An early 20th century reproduction cast bronze Benin leopard figurine. 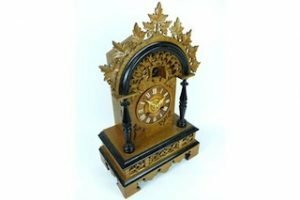 A Victorian black forest cuckoo clock, composed of an oak and ebonized oak designed case with carved vine leaf detail, original carved bone hands and Roman numerals, painted wooden cuckoo and ebonized pillars with triumphal arch detail. 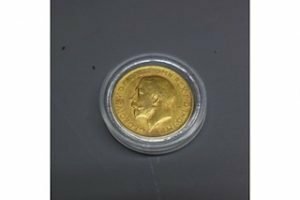 A 22 carat gold full sovereign dated 1918. 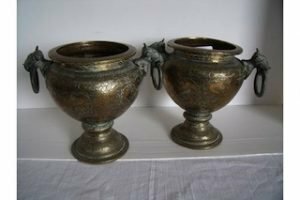 A pair of Indian brass urns with elephant mask handles, the bodies engraved with elaborate scrollwork and various figures, on circular bases. 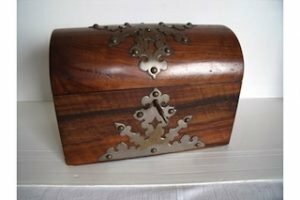 A late Victorian rosewood dome top box with brass mounts and hinged top, opening to reveal a lined interior containing a carved wood mahjong set. 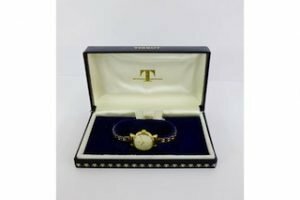 A Ladies vintage gold plated Tissot wristwatch, with champagne dial and Arabic numerals, on a bracelet strap.